HARRISBURG, PA – At a pipeline safety hearing today in the Pennsylvania legislature, residents and state legislators took turns bashing Sunoco/Energy Transfer Partners over their continuous rogue corporate behavior during the construction of the contentious Mariner East 2 pipeline. The Philly Inquirer captured it all perfectly with this headline: “Absent Sunoco is thrashed at Pa. pipeline safety hearing”. 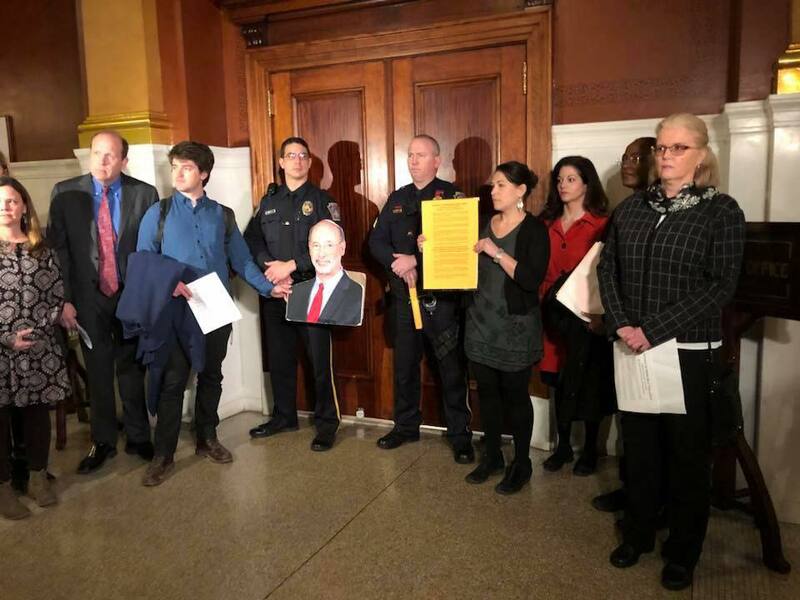 Today in Harrisburg, residents from Delaware and Chester counties, accompanied by municipal leaders and elected officials, delivered a Notice of Probable Violation to Governor Tom Wolf. Governor Wolf refused to acknowledge our presence or our plea. In fact, he closed his doors on us. In a nearly unprecedented move, when we arrived to the governor’s office, his public waiting area, which is always left open, was closed with 2 capital police officers blocking our way. We came to Harrisburg to support residents from Uwchlan Safety Coalition and Goshen United for Public Safety as they testified before a Senate Hearing on pipeline safety about the unparalleled risk that is being imposed upon our communities. Wolf has literally closed his doors to us. Meanwhile, Sunoco continues to build their pipeline. In West Whiteland Township, the sinkholes continue. In Lebanon County, Sunoco spilled drilling mud into a stream for the third time. In Delaware County, Sunoco has announced that they are planning on contaminating wells and water supplies; it will just be one of the many consequences of #MarinerEast. Our coalition stands in solidarity with the people of Pennsylvania who are standing up for their right to clean water and public safety. It’s beyond time for Governor Wolf to listen to his constituents and shut down Mariner East 2 for good.